On June 29th Team Ignition was on hand at the Ndamukong Suh Pro Workout in Detroit. The camp was held at Walled Lake Western High School and over 100 kids showed up to experience an NFL Combine type atmosphere. Football players ranging in age from 15-23 years old were measured in the Broad Jump, L Cone Agility, Pro Agility and the 40 Yard Dash. During the workout, athletes got expert instruction from former NFL Player Frank Murphy. In addition the football players learned the “Ignition 40yd dash stance” and also heard a message on the importance of character from Coach Murphy. Campers received an autographed team photo and also a T-shirt for participating in the event. 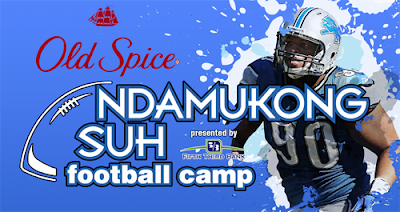 Ignition was honored to be a part of this successful event and would like to thank Ndamukong Suh, Pro Camps, US Army and Elite Athletic Events for the great opportunity to serve the kids in the Detroit metro area.